about anything we want. I decided to write about what I have been doing for fun this summer. I recently found out that I was going to become a great grandma for the first time as my granddaughter who is 25 is expecting in August. I decided I would make her something that she can keep and that will mean more to her. My first project was to knit a baby blanket which is actually not a baby blanket, but large enough to cover both baby and mom when they get up for nighttime feedings. Once I finished the baby blanket I decided it would be fun to make her a scrapbook for the baby so all she has to do is insert the pictures when she takes them. Here is how that turned out. The pictures don't show it that well, but I am pleased with how it turned out for the most part. Next week I plan to ship it to my daughter's house so that I don't have to take it on the plane with me. July 12th I am leaving to spend a week with my daughter and her family to attend the baby shower and while I am there I will also get to meet my grandson's girlfriend from college which is exciting. Beautiful gifts for the new baby and mom that they will cherish forever. The blanket and scrapbooks are something your granddaughter will cherish. Very nice! Love the scrapbook! The blanket turned out wonderful! I love the color too!! You are really talented! I love the scrapbook you made so that all your granddaughter has to do is insert the pictures. I never would have thought to do something like that. I'm sure she'll love both gifts!! I'm really happy for you that you'll get to be at your granddaughter's baby shower. Getting to meet your grandson's girlfriend should be great too. Enjoy your visit with your family. The blanket is absolutely beautiful! You worked so faithfully on it - your granddaughter will love and treasure it! I love doing scrapbooking - that is such a great idea to make a blank one for a gift, so they just have to put in the pictures. You are very creative! The blanket is beautiful, and I love how the scrapbook turned out. So much work and love was put into both. Your granddaughter is blessed to have a grandmother like you! I'm so happy that you can be at the shower. Meeting your grandson's girlfriend is the icing on the cake. Congratulations! I love the blanket big enough to cover Mommy & baby @ feeding time! The scrap book is beautiful. Beautiful gifts and so very thoughtful. The new family will love them! How wonderful! I take it from the pink and purple the newest addition will be a girl? How super you can travel and get to go the baby shower. Hope you have a wonderful time and enjoy time with your family. Those are beautiful gifts - and they will be so meaningful to both mom and baby! Beautiful! I love the color of the blanket. 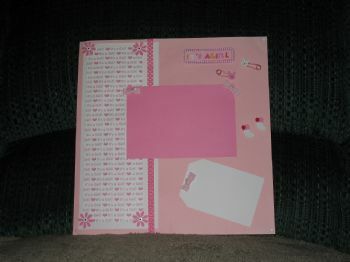 The scrapbook pages are really creative, and I'm sure they'll enjoy filling it with pictures. What thoughtful gifts! You are so talented. She is going to love both gifts, especially since they are homemade with love. I'll be getting back from visiting at my daughters house just when you get ready to take off. Daughters are such a special gift. Enjoy your time. You are very creative. She'll love them both. Family - wonderful. The scrapbook is a good idea, and the blanket will be a keeper. Gorgeous. Your granddaughter & greatgrand child can both cherish these.